Image Release *- Release so that your child's image may be used on our site or other media. Contract *- USE IF YOU CHILD DID NOT PLAY WITH WYFC/SDYFC IN 2015. Please complete and bring to in person registration. Include Picture that will fit in the box in upper right corner. Image Release *- Please print, sign and bring to in person registration. Physical Forms *- USE ONLY IF YOUR CHILD DID NOT PLAY WITH WYFC/SDYFC IN 2015. SDYFC Code of Conduct *- Please print, sign and bring to in person registration. Wavier *- Please print, sign and bring to in person registration. Release of Liability *- Please print and sign this form. Bring it to or coach for verification of parent acknowledgement. 2016 Contract *- Use this for your 2016 Fall registration. Refund Policy *- Please print, sign and bring to in person registration. Air It Out Football Academy *- Get high level instruction from coaches Matt Hoss and Dan Lewis at the QB, RB and WR. Get the competitive advantage and enroll today! Cheer Clinics *- March 10th Cheer Clinic at WVHS, with top notch coaches and student mentors. Sign up today! Cheer Clinics *- Cheer Clinic with top notch coaches and student mentors. Sign Up Today! Inclined Training Clinic *- Learn all the elements of speed agility, biomechanics, sprinting, dynamic training, and athletic attitude to increase your competive edge for any sport. 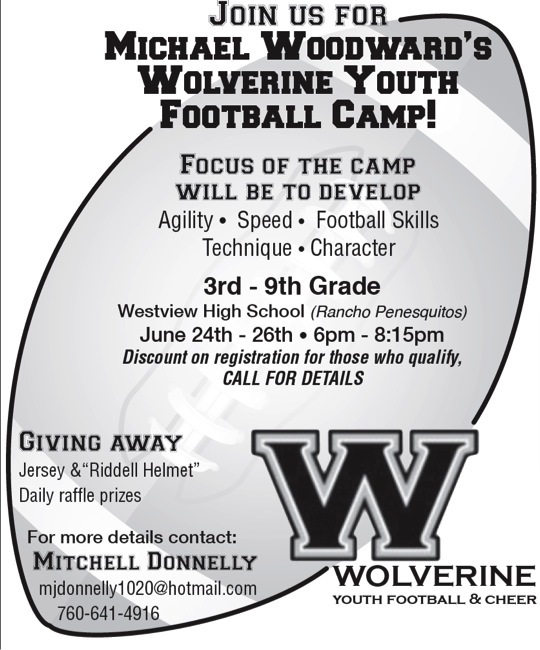 M.A.D.E Sportz *- Popular "4 Quarters" Series of football training with top shelf trainers. WYFC Safety Manual 2013 *- The following procedures are presented for all San Diego Youth Football and Cheer member Associations as guidelines for preparing for and handling emergencies. It is recognized that good judgment is the key factor in any crisis. When in doubt, all efforts should be extended to protect the health and welfare of the athlete. WVHS CAMPUS RULES *- Please review these rules for 2018.